The past week probably scared everyone except hermits living in distant caves. No matter how hard you try to protect your children, your fear infects them. So this week, I am writing about fear. First a poster quote. The above saying went viral after the two horror filled events of the week of April 15, 2013 and with good reason. 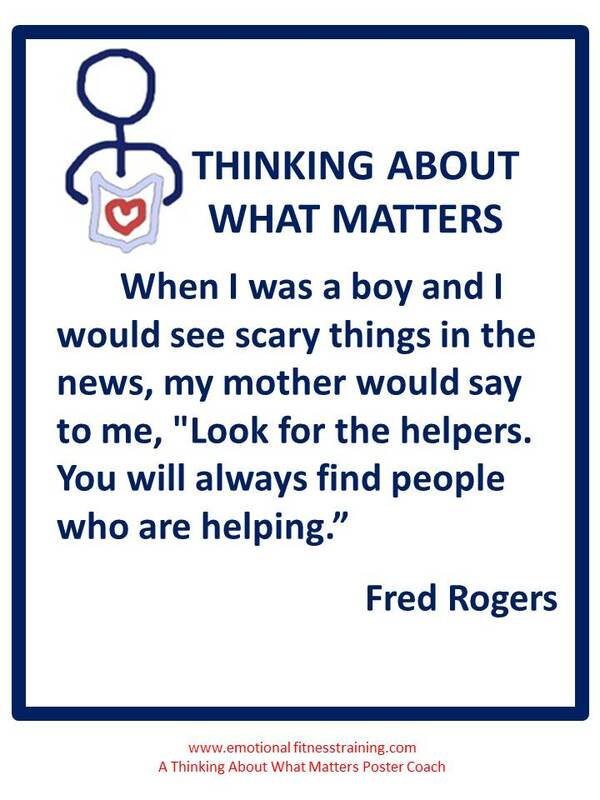 I would add to it, “Be a helper.” All the studies state that being able to help during traumatic events buffers the helper from being traumatized. Something I learned personally while working in NYC before, during, and after 9/11. As I drove to work that day and saw the tower burning from the first plane; by the time I got to work, the second plane had done its work. I was in charge of a mental health mobile crisis service. We were located in the Bronx and so able to do a bit to help than many of people in Manhattan. With the help of a state official I was able to get the first crisis help line up and running. My team was lucky, we became the helpers. Parents are always helping, but need tools to help effectively. Roger’s quote is a good beginning. I have a few more tips. Tip one: Make a point of teaching children what the word safe means as soon as they begin talking. My eighteen month old grandson and I were hiking around our apartment complex. He did not want to hold my hand on the sidewalk. I forced him to, and said, “Safer.” When crossing streets, I made him stop, said “Dangerous.” Then when crossing, I said “Safe.” by the end of our little hike, he was stopping automatically and did not object to holding my hand. Of course, he did not really know what the words meant, but ground work had been laid. By the time these kids are in school, these words and their meanings will help guide them. Not magic but a beginning. Tip two: The most natural instinct of anyone who cares about a child, is to want to protect them from harsh reality. Turning the TV off, not exposing a child to scary movies or videos matters. At the same time, a bit of exposure to scary stuff is strengthening. One key is always in being there. Another is always drawing a line between real stuff to be scared about and fantasy. I quarreled recently with a parent bragging about her efforts to “Keep the Tooth Fairy alive. Not teaching reality and fantasy can be just as much fun, but when the child thought processes change, s/he will not feel lied to. Something that happens when fantasy is made too real. Tip three: As soon as school starts begin teaching your child several things that will help her or him stay strong. Karate with a peace oriented teacher. For teens, a Red Cross First Aid course. These are skills that make your child safer, but also increase his or her ability in times of trouble to be a helper. Tip four: An explanation about why bad things happen buffers all. How do you explain the evil acts of people and the acts of nature that kill innocents? Most of us have an explanation of some sort: God’s plan, randomness, karma, the Force, Life. The healthiest explanations are those that promote kindness for all living creatures. Tip five: Dampen your own fears and horror. Two of my newest eBooks are designed to help you do just that. One: 12 Easy Exercises to Tame Mad, Bad, and Sad Feelings. Added value? Many of the exercises can be taught to your children. Two: Self-soothing – Create Calm in Your Life. Either one lasts longer than a MacDonald’s Happy Meal and has more value for you and your children. Tragic events are a fact of life. The more tragic the event, the more it changes you. Still people survive and go on. To go on, means you have taken the lessons from the event, realized that was then and this is now. I doubt that anyone reading this lost loved ones in any of the week of April 15th’s events. Too soon. Still, those of us here have been affected. Secondary trauma is real. My advice slow down, spend comfort time alone and with your family, practice sharing and caring, indulge in healthy pleasures, and remember what matters. This entry was posted in Parenting Issues and tagged Dealing with trauma, emotional fitness tips, Emotional Fitness Training Inc, emotional intelligence, kids, parent tips, Parenting advice, parents, postaday, Poster Quote, Self-care, stress relief, teens. Bookmark the permalink.